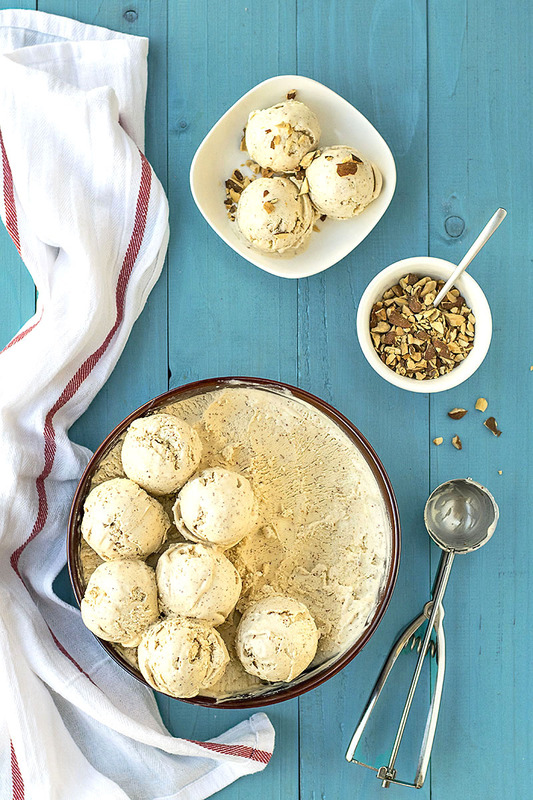 This no-churn ice cream is one of my most requested summer desserts! 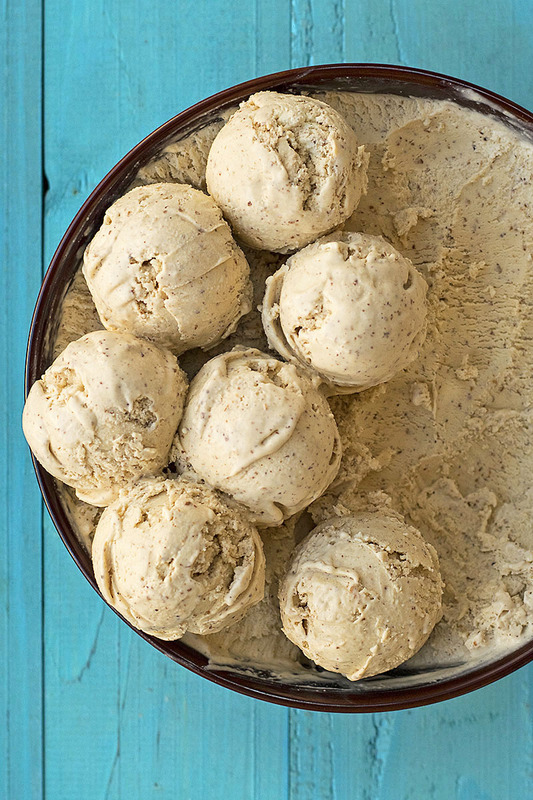 It is soft, velvety, and full of roasted almond and white chocolate flavor! My other favorite no-churn ice cream recipe is this Turkish delight ice cream, which is a tiny bit more complicated because you have to melt some turkish delights into the base (but I have included a shortcut with rosewater, in case you don’t want to get into the extra trouble). 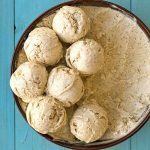 This is a variation of the well-known no-churn ice-cream recipe that uses 1 can sweetened condensed milk and 2 cups heavy cream beaten into whipped cream. To this, I have added 1 full cup of roasted almonds that have been blended with some milk and white chocolate (think of an almond praline but without caramelized almonds, though you could get into the extra trouble and caramelize them). 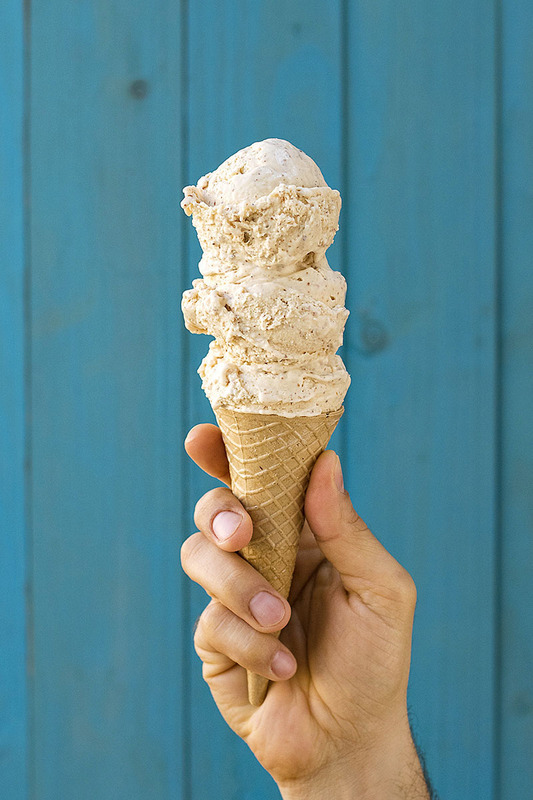 Almonds and white chocolate have enough fat to keep the ice cream very smooth and velvety, while at the same time don’t leave you with a greasy feeling in your mouth. And just in case you’re interested, you can also stir in the ice cream mixture (just before freezing) some salted dark chocolate olive oil magic shell. The taste is amazing! You can also add some crushed roasted almonds for crunch, or even some crushed cookies, or whatever comes to mind. Sky is the limit, people! The aroma and flavor of freshly roasted almonds are incomparable, so try to buy them raw and roast them yourself. 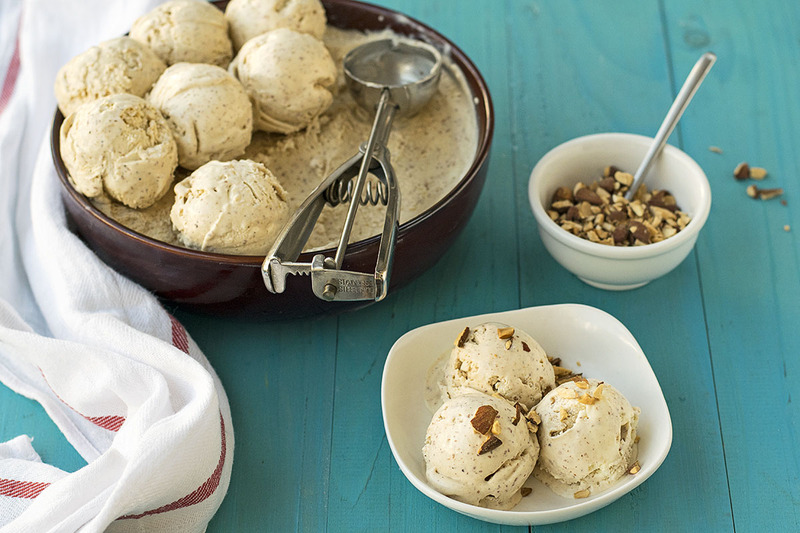 You can substitute hazelnuts for the almonds. If that’s the case, you’ll have to rub the hazelnuts with a clean towel once they’re out of the oven, to remove their skins (hazelnut skins can give a bitter taste to your recipes). You can substitute the same quantity of roasted almond butter if you can find (cookie butter is also a great alternative!). Make sure your heavy cream is very cold before beating it with the mixer. Transfer the almonds, the milk, the salt, the cinnamon, and the vanilla to a blender and blend until smooth. Add the white chocolate and blend again until it’s incorporated. Beat the heavy cream with your electric mixer until soft peaks start to form. Add the sweetened condensed milk gradually, while beating, until you have a fluffy mixture. Continue by adding the almond/white chocolate mixture and beat until you get a light and fluffy result. Transfer to a container suitable for the freezer and freeze for 4-6 hours or overnight. How to roast the almonds: bake them in a preheated oven at 350°F (175°C) for 15 to 20 minutes or until fragrant. I use them with their skin but you can also use blanched almonds. Love that this is a no churn ice cream. Using of roasted almond is a great addition cz of its unique aroma. 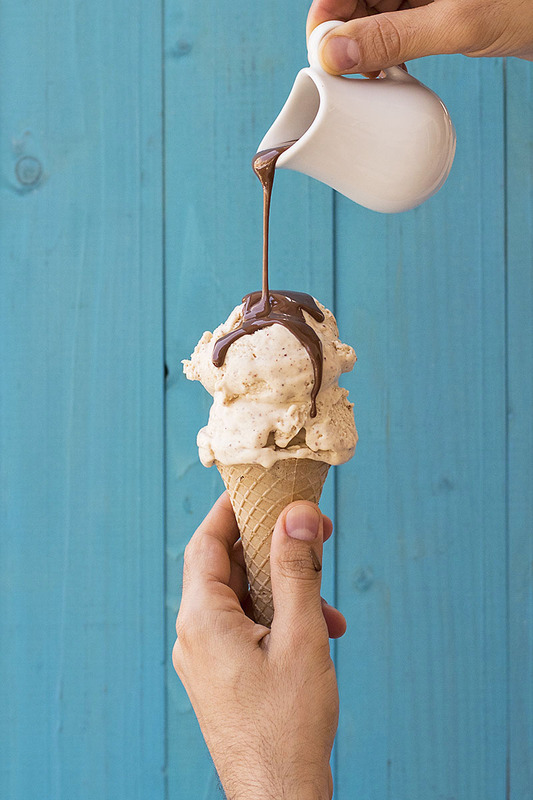 And these photos looks fabulous (knowing ice cream is one difficult subject to shoot)!!! Thanks! As you can see from the photos with the ice cream cone, it became really soft after a while! 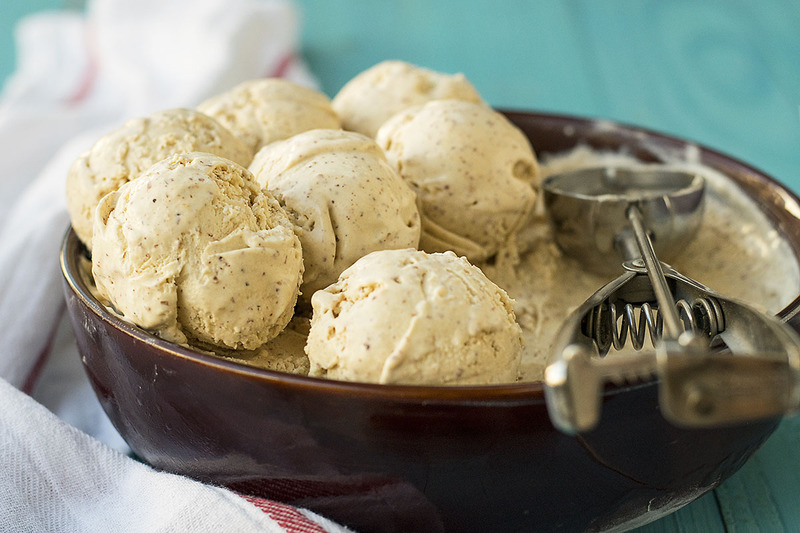 That is one incredible ice cream…I’d make this and accompany it with baklava to make it even more sinful . Oh yes! Baklava would be great with this! Holy Moly Makos! Your desserts are going to make me fat (because I am going to make a lot and eat them all to myself pwahaha), and I LOVE IT! I too ate it (almost) all by myself! pwahahahahahaha!! !